October 2014 – He Said What?! Now there’s a good, solid word for you……stability. I believe that all of us crave stability even in the midst of changes in our lives. Some changes are exciting……new friendships, marriage, a new job, a new house, new baby. Yet even in the midst of these positive changes, we desire an inner stability….a steadiness in our lives at the core of our being. If we find ourselves facing unhappy changes, then our inner stability can be threatened and we can become very unbalanced. I remember losing my balance a couple years ago on our stairs in the middle of the night as I let our dog out to go potty. I hung on for dear life as I rocketed down the stairs after losing my balance. Our thick wooden door at the foot of the stairs was my stopping point, my shoulder slamming into it full force. That instability resulted in major shoulder surgery with months of recovery and rehab, and still today I have a shoulder that will never be the same again. I know a lot of people facing instability in their personal lives today…..we all do. I just heard last night about a dear 33 year old mother of four that I know who had a major stroke on Saturday. I’ve had several conversations in this past week with parents who are terribly hurt and worried about wayward children. We and our other neighbors are helping our little elderly neighbor, Nora, move to assisted living after losing her husband to cancer in May. A year ago she never dreamed any of this would be happening. Actually, none of us knows what a day will hold for us when we climb out of bed in the morning, do we? These kinds of instability, and so many others, can rock our world. We can be shaken to the very inner parts of ourselves. But I also know that even when we are surrounded by so much instability, we can…..deep, deep in our souls…..have a constancy that never changes and is never shaken. Of course, I’m referring to our relationship with God. When you have a personal relationship with the One Who is always constant, then you know that you can lean on him when life becomes unbalanced, for He never shifts or changes. The first part of Isaiah 33:6 jumped out at me this morning: “He shall be the stability of your times.” I know this chapter is talking about the future, but I also know that we can apply this truth to our lives as believers right now, today, because it’s a truth about God that never changes. What are your times? What are my times? What times are we each living in at this point in our lives? Whatever it is….wherever we are…..if we know the Lord, He will be the stability of our times. And I think of our Aaron, who in so many ways forces Gary and I to fall back onto the stability of God. 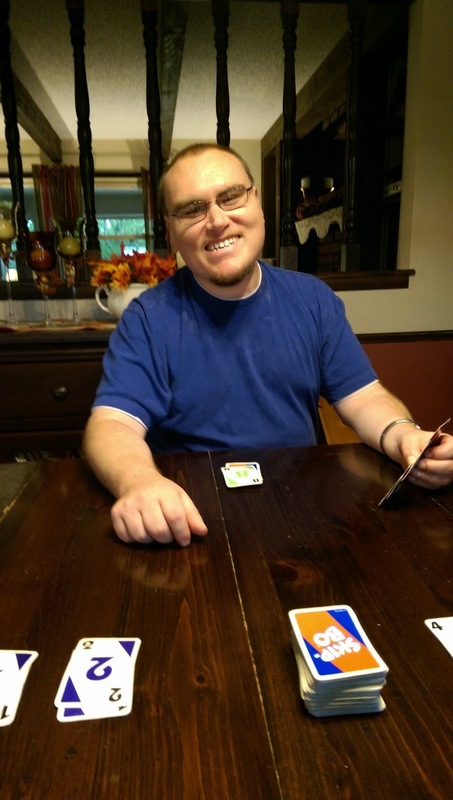 Aaron’s Epilepsy and autism are issues that we deal with every day of our lives…..and just when we think we’re somewhat coasting along in our version of normalcy with Aaron, something changes. It could be a behavior or a health issue, but change is fairly certain to be constant with Aaron….if that makes sense. Gary and I were slapped in the face with this reality on Saturday night. Aaron had one seizure during the night before, which is not at all unusual. He has had seizures in his sleep for years after enduring all sorts of other seizures, day or night, during his young years and into puberty. 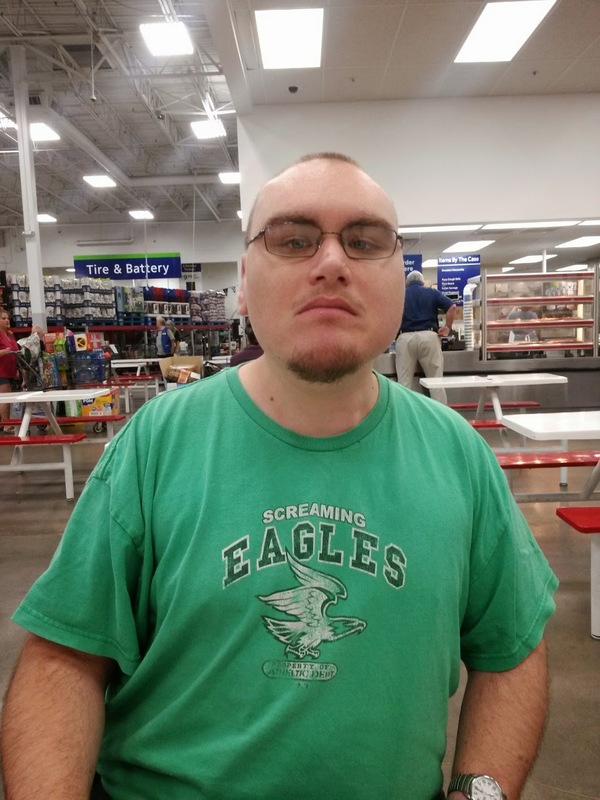 We have grown accustomed to rarely ever seeing a seizure when Aaron is awake…..except for one at the theater with his group in September and one at the YMCA a few weeks ago…..and then again Saturday night. Gary and I were watching the World Series, and Aaron was sitting in Gary’s desk chair talking to us. I looked down at my notebook on my lap, and in two seconds Gary called my name. I looked up to see Aaron having a seizure, out of the blue and totally unexpected. Gary was able to keep him from falling out of the chair, and when it was over and Aaron was a little lucid, we eased him onto the floor. Aaron was conscious but he wasn’t with us. His eyes were wide, his arms and hands kept lifting up awkwardly as if he was reaching for something, and he couldn’t speak. He tried to speak, but all he could manage was a smile. That was pretty heartbreaking. Finally he was able to muster one word, with effort. You can guess what it was. “Mom?” he said. I had to smile to keep from crying. Aaron must say “Mom” at least a hundred times a day…..or so it seems…..so it was fitting that this was the first word he was able to say. We kept him with us while we watched the game. I tickled his back, which he loves, while he recovered. Soon he was talking again about aliens and wanting to go to his room to watch his alien movie, which we reluctantly let him do. It’s just that we have this fear now…..that started a few weeks ago…..as we see him edging back into sudden daytime seizures while he’s up and around. On the next day, Sunday, we let him sleep. He woke up too late for Gary and me to go to church, but we wouldn’t have left him alone anyway at that point. We later took him with us to Sam’s, which he loved, and on the way home I told him that I would fix the Lasagna that he had been wanting. That made him very happy. 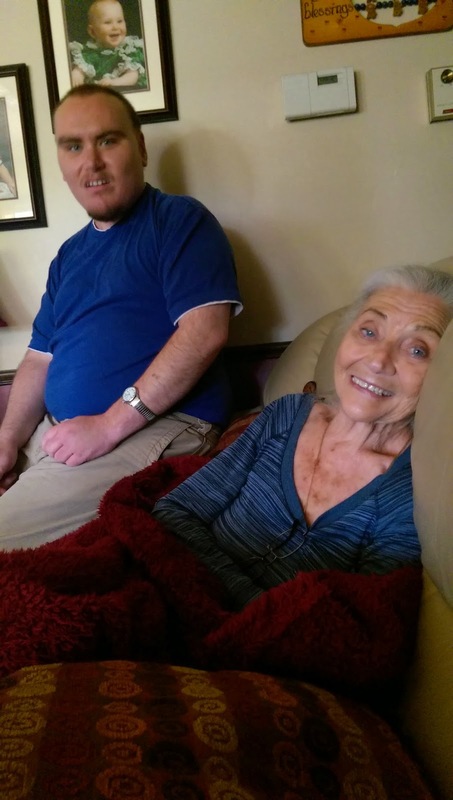 I invited Nora over for lunch and to watch some football, not knowing if Aaron would be nice to her this time or not…..but he was perfectly nice and funny…..and we had a wonderful afternoon. Of course, we had to endure watching some of Aaron’s Mountain Monster show that he was watching before we could change the channel to football. For the rest of the afternoon, after Aaron had gone back up to his room, he kept bounding down the stairs and coming into the family room to ask Nora some important questions. Questions like: Would you eat an alien egg? Did you know that those aliens have concentradik (concentrated) acid in their blood? Why is there a Queen alien? Have you seen aliens hang from the ceiling? Would you watch the movie, Alien? With each question, Aaron would bend over and rub his hands together with delight…..and Nora would laugh and laugh. He didn’t really care about the answers to his questions. He just wanted to talk and to share his alien discoveries and to be the center of things…..which he is without even trying. Later, he and I played Skip-Bo. You would never have known he had such a strong and unexpected seizure the night before. Life with Aaron has returned to normal. Just now he came downstairs carrying a little dirty carrot from the bucket of garden produce that I haven’t yet washed. 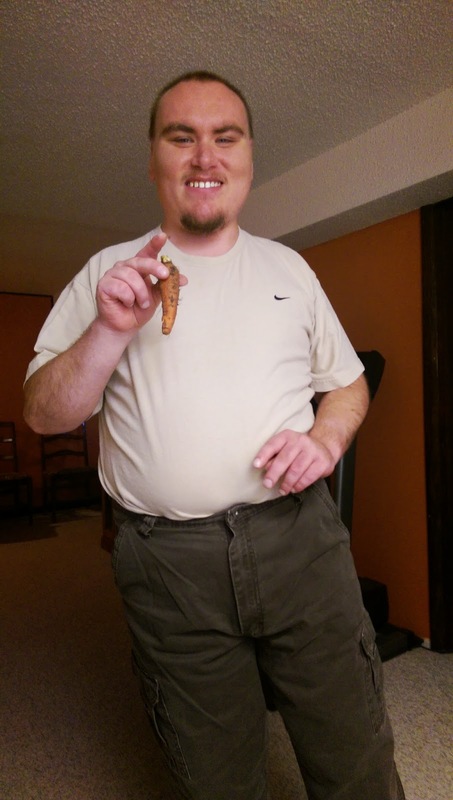 He was so excited to hold that carrot and to ask questions about the carrot….and to let Jackson sniff it, of course. Typical Aaron. We have the continuity…..the stability…..of who Aaron is mixed in now with that cloud of fear concerning his unexpected seizure activity. Instability is at the back of our minds. I know that’s to be expected because we love Aaron and we are concerned for him. But I’m so thankful that we can lean on God when we feel ourselves getting unbalanced with worry, and know that He is “the stability of our times.” None of these developments surprise Him. He is here with us and here with Aaron. We all learn the deepest lessons in the hard times. We test the solidness of God when the ground upon which we stand is uneven and giving way beneath us. Whatever you’re going through, I hope that you have experienced the stability of God in the center of your pain. He is there for you, constant and sure. I pray that I remember this truth in whatever lies ahead as well. Aaron went to the pumpkin patch today with his day group. Every year that he has gone, he brings back a pumpkin that we place on our front porch. Aaron’s always proud of his pumpkin patch pumpkin, and he loves seeing it sitting on our porch. Today he bounded in the door as always, jacket dragging on the floor. He was full of things to tell me. I got the first word in, though, as I quickly said hello and then asked him right away if he had enjoyed the pumpkin patch. He said that it was OK, but he thought it was a little dumb. That’s pretty typical Aaron. He was more anxious to tell me something important, though, than to discuss anything else about the pumpkin patch. “Mom,” he said in his urgent voice, with a sort of whisper sound thrown in. I knew this was special, so I stopped what I was doing and I looked at him. “Guess what I told Rosie today?” he asked. He waited, so I asked him to tell me what he told Rosie. “I told Rosie that I love her,” he softly said. We stood there, eye to eye for a few brief seconds, and then Aaron rubbed his hands together with delight and laughed a very happy laugh. He then told me that Rosie gave him a hug. And later he repeated the story to Andrea, with the same delight that he had conveyed it to me…..and to Gary, as well. 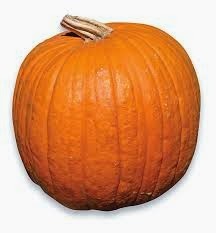 Oh, after Aaron told me of his declaration to Rosie, I realized that he had not carried in a pumpkin. I asked him where his pumpkin was. “I gave my pumpkin to Rosie,” he happily said. And off he went to his room. Well now, isn’t that the way it is? Mom is second fiddle now. I may never get Aaron’s pumpkin patch pumpkin again. Author hesaidwhatksPosted on October 16, 2014 February 28, 2016 Categories Adult Autism, Asperger's Syndrome, Friendship, http://schemas.google.com/blogger/2008/kind#postLeave a comment on Where’s The Pumpkin? Share: to partake of, experience, or enjoy with others. Aaron, for some unknown reason, has been in a sharing mood lately. It’s encouraging to Gary and me to see positive traits such as this in Aaron. Anytime he thinks of others beyond himself, besides slapping them on the back or making a rude remark about them, makes us surprised and thankful. His sharing of late has come in the form of bringing us little portions of his special snacks. A couple cashews here, a few gummy bears there, a piece of gum thrown in the mix……it’s all been part of his sharing frame of mind recently. Never mind that we are often fearful of actually putting any food item that Aaron brings us in our mouths. We just never know where those hands of his have been, if you know what I mean. According to our scientist daughter, being exposed to germs helps to build our immune systems. Therefore, Gary and I should never be sick again in our natural lifetime. We were sharing Aaron…..and it was so much fun. On Saturday afternoon, while Gary was immersed in being our IT man and working on my computer, I asked Aaron if he wanted to go out with me to do a little shopping. He stood in the bathroom while I fixed my hair, hovering, thinking that his hovering would make me hurry and we could get this show on the road. Soon he was coughing. “You made my breath feel strong because of hair spray!” he sputtered. That’s when he decided to wait for me downstairs. Aaron’s all about shopping, always hoping that he’ll come home with some treat or item that’s just for him. On the way to Big Lots, he asked, “Mom, is it about clothes?” I assured him that this trip wasn’t about clothes, and he was able to relax then. 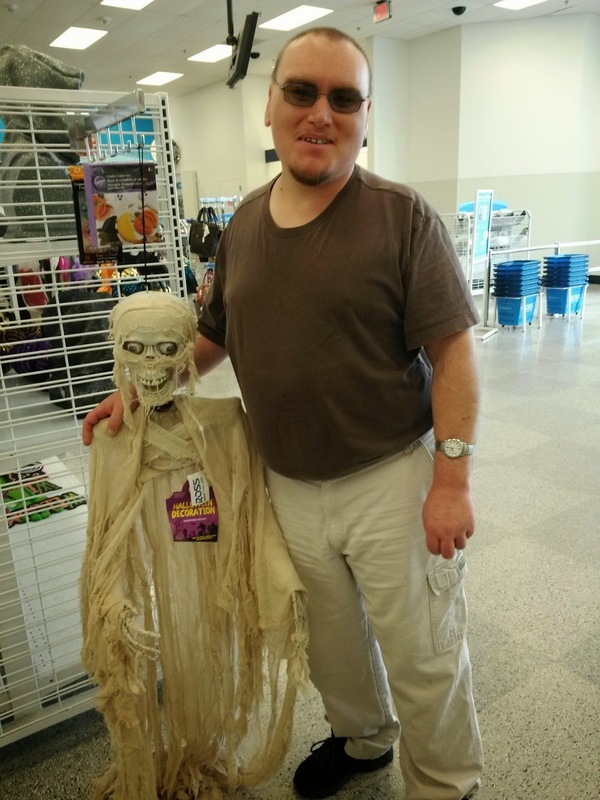 He helped me look at seasonal rugs, and then off we headed for Petco, where I told him I wanted to look for dog bed covers for Jackson……no rugs at Petco for me….and no clothes. 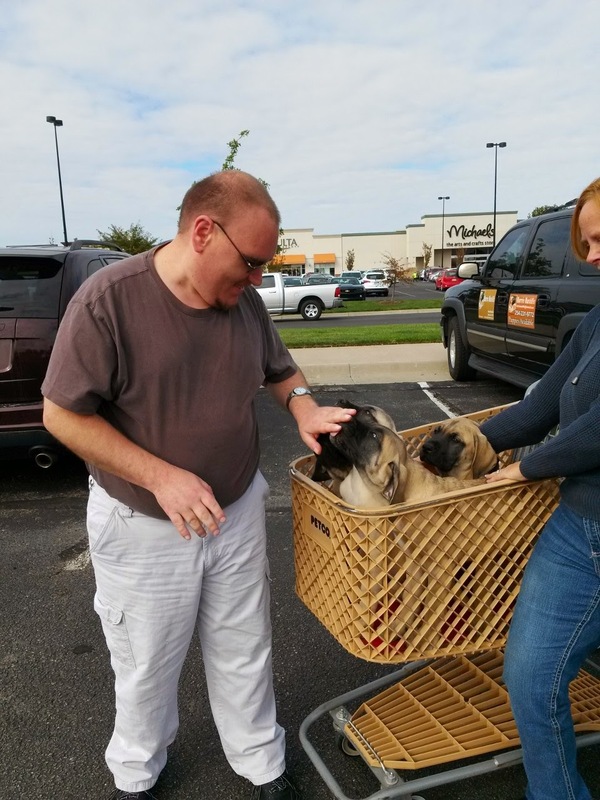 We struck gold before we even got in the store, because there in the parking lot was a couple with a cart full of four amazingly adorable Mastiff puppies. Aaron headed straight for them and they gladly let him pet their puppies. Once in the store, Aaron had to show me the fish….the hamsters….the gerbils….the various birds….the ferret….. I commented on how much the ferret cage smelled, so as we left the store, Aaron took it upon himself to stop at the front counter. He didn’t care that there were people standing in line. He stopped and informed the cashier that his mom said the ferret stunk, as he laughed and rubbed his hands together, and everyone stared at him…..and mom told Aaron to come on as she walked out the door like nothing at all was unusual. Sharing Aaron….. 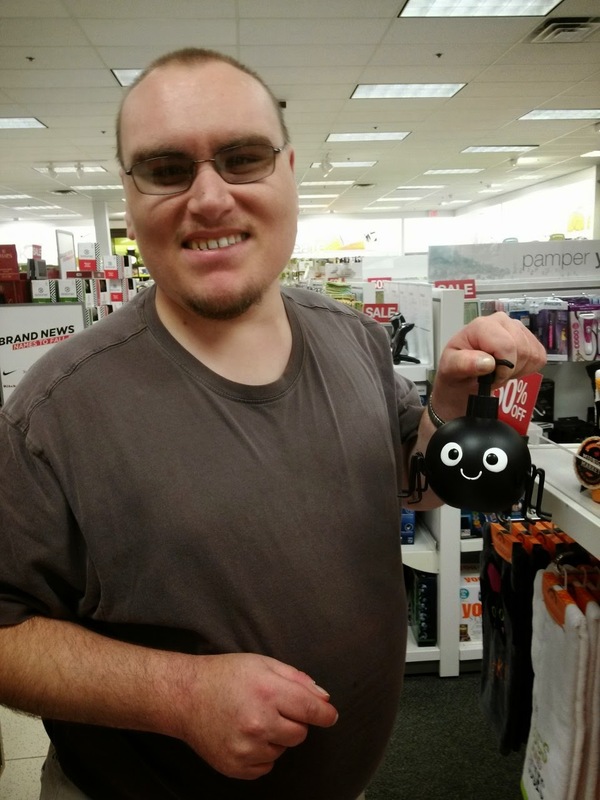 There were no rugs in Kohl’s, but Aaron found the coolest spider soap dispenser ever. I would have hurried right by it, but not Aaron. “Mom! !” he exclaimed loudly. “Look at this!” Others looked, too……sharing Aaron. I suggested that we look inside Ross, right next door to Kohl’s, so Aaron gladly trotted along beside me…..ready to explore a new store. It only took a second for him to see the hanging skeleton just inside the door…..and you know the rest. We finally made it to the rug aisle, and looked at several styles and colors. I would unfold one and look at it……put it back on the shelf and unfold another one……several times. Aaron was about done with this silly rug business. 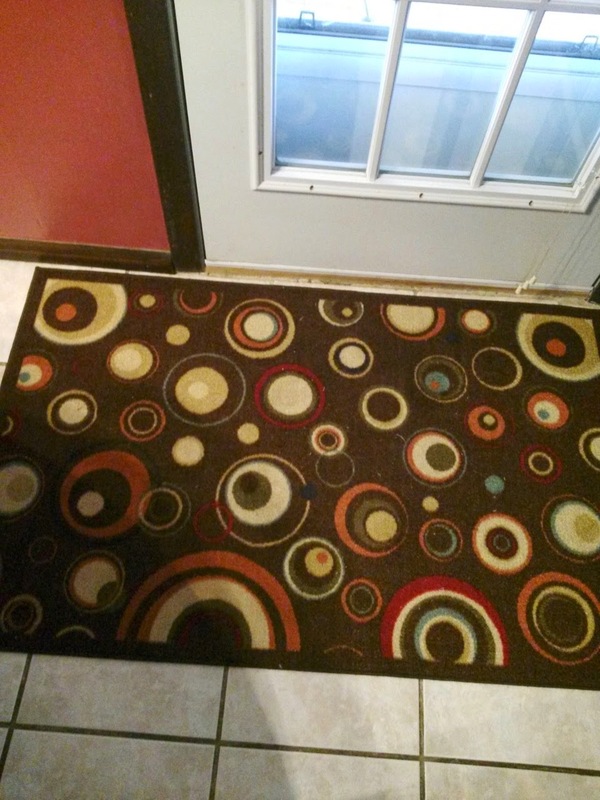 “Mom, you can’t make up your decision with rugs!” he said with a small measure of patience. So I quickly made up my decision…..the one with dots, as Aaron described it, and we went to stand in the check-out line. There were several customers in front of us on this busy Saturday. While standing there, Aaron found a bag of gummy bears that I agreed to buy him. He held his gummy bear bag but he was observing everything around him, as always. At one of the counters there stood a man making his purchases…..a man with a very modern Mohawk hair cut…..and I should have seen it coming. “Look at that guy’s hairdo!” Aaron broadcasted loudly. The young lady in front of us turned and smiled while I smiled back, and also while I told Aaron to please try hard to whisper……but to try even harder not to comment on people…..in any way, shape, or form. Please! Not in ANY way, shape, or form whatsoever! Sharing Aaron…..
We were finally driving home, rug and Aaron in tow…..and I was so thankful that either Aaron didn’t notice the other Mohawk hairdo man coming in the door as we left…..or he just decided that he would listen to Mom for a change and not comment. Probably the former. Anyway, as I drove Aaron said, “Mom, sometimes Brian at Paradigm does this.” And I looked over to see Aaron comically trying to make his facial muscles move. “And flaps his ears!” Aaron finished. I laughed at the thought of flapping ears, which made Aaron very happy. Sharing Aaron…..
Later that night, as I sat at my desk doing some things, I heard Aaron coming up the stairs. Without saying a word, he plopped down several gummy bears for me. I thanked him while determining in my mind if I should eat them, but Aaron walked away and I was saved from that decision for the moment. But in just a minute I once again heard him coming upstairs, where he put even more gummy bears on my desk…..and walked out quickly. Down the stairs he went…..and wouldn’t you know, soon he was headed back up. He walked in my room again, but this time he didn’t leave me any gummy bears. Instead he reached down and took some off my personal pile of gummies, smiled, and started out the door. “Are those for dad?” I guessed. And he said they were for Dad, and thumped down two sets of stairs to give his gummy gift to Dad. Aaron sharing…. 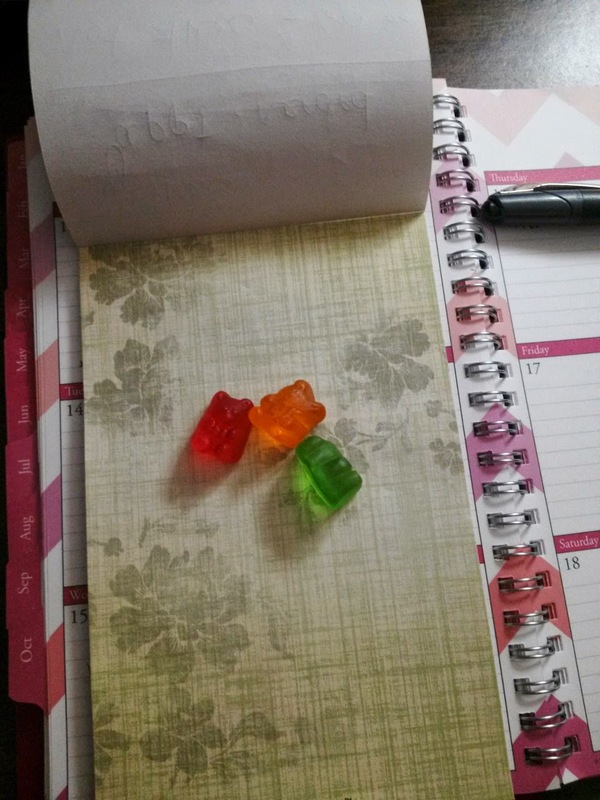 I looked down at my remaining gummy bears and saw three soft bears there on my desk calendar. Three bears…..Aaron, Gary, and me, I thought. How perfect! Gary and I, sharing life and sharing Aaron. And Aaron, sharing with us…..more than just gummy bears. Sharing his unique way of living, in many different ways, shapes, and forms. Aaron can drive us a little….or a lot…..crazy with his desire for life to be predictable. His life, that is. He really doesn’t concern himself much with our life, to be honest. He enjoys the sameness of every day, but rarely is every day the same, so he is forced to adjust on those particular days or moments. Sometimes he adjusts with relative ease, and other times we drag him kicking and screaming into the world of change. 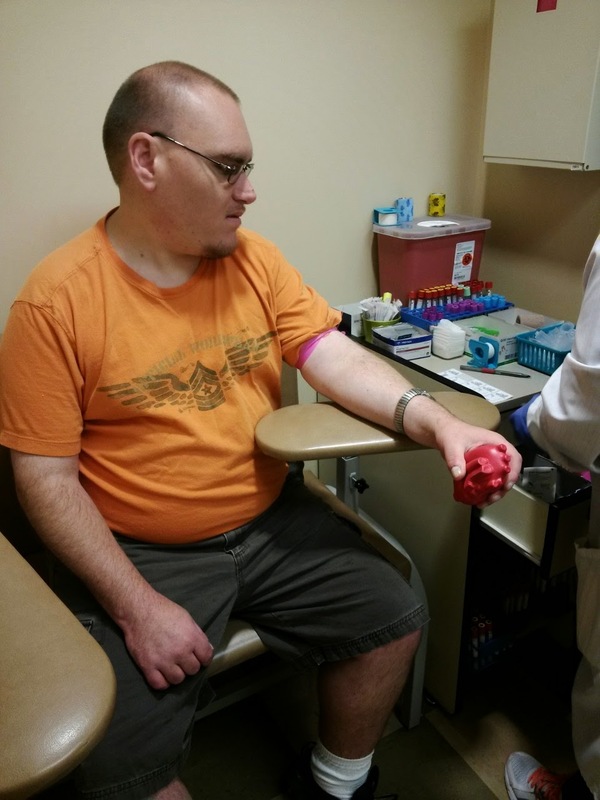 Last week he knew that I was taking him to the lab for some scheduled blood work. I had told him that he could take the day off from his day group. We were going to the lab and then out to eat lunch at his favorite place, Carlos O’Kelly’s…….favorite because of the unlimited chips and salsa. Aaron loves unlimited food, so he prefers Carlos O’Kelly’s to Chili’s, because at Chili’s we have to pay for the chips and salsa….and sometimes Mom doesn’t want to pay for that, of all things…..so, predictably, Carlos O’Kelly’s is his restaurant of choice. “Is what 10:16?” I asked. “Five minutes would be 10:16,” he informed me. Believe me, we left the house at 10:16. And predictably, he watched every move the lab tech made and he watched her draw his blood even though she told him to look away and he wore his watch way up his arm…..as he always does. EXACTLY as he always does! Aaron loves taking Jackson on walks around our neighborhood circle. Jackson is getting old, so we only take him when the temperatures are cooler. One day Aaron asked if we could Jacks on a walk and I told him that we would do it later, when it was cooler outside. “When will that be?” he asked. I told him I didn’t know…..just that it would be later. It wasn’t long until Aaron came back downstairs. “What time will we take Jackson on a walk?” he asked. “I don’t know. Just later,” I once again answered. This scenario was repeated several times. Finally, after Aaron asked again what time we would leave, I told him that we would leave sometime after 7:00. Just so you know, the word “sometime” is not concrete enough…..for Aaron. We left the house at 8:00. Last week Aaron’s Paradigm driver, Lisa, had texted and told me that she would be a little late with Aaron’s pick-up. As Aaron and I sat in the parking lot waiting on Lisa to arrive, he was getting stressed because she wasn’t there yet. I told him that Lisa had texted me and that she would be a few minutes late. “Well, I don’t know EXACTLY, Aaron,” I answered. I reminded him about things like other’s schedules…..traffic…..car problems…..trains. Aaron was silent for a minute. I guess he thought I hung my head because my neck hurt. Yesterday morning he kept asking if Jackson could ride with us in the van to meet Aaron’s group. I had to think about my morning before I answered EXACTLY that Jacks could come. So several times after Aaron asked me this same question, I told him that Jacks could probably come. Just so you know, the word “probably” is also not concrete enough……for Aaron. “Stop with the probably!” he finally informed me. And that is EXACTLY what I need to remember with Aaron. Stop with the probably! No probably for concrete Aaron! Author hesaidwhatksPosted on October 7, 2014 February 28, 2016 Categories Adult Autism, Asperger's SyndromeLeave a comment on EXACTLY!! Aaron stayed home yesterday because he had three seizures during the night. I let him sleep in so that he could recover. He got out of bed, drank some coffee, and took his meds along with some pain reliever for his headache. I needed to make a trip to Sam’s but I wouldn’t leave him at home by himself, so I asked him if he felt like going with me. He jumped at that opportunity, seeing visions of a cart full of items that he wanted…..not paper towels and toilet paper and boring meat, for sure! And the offer of eating lunch there was too good to pass up, so off we went, listening to music and listening to Aaron talk about everything he saw…..of course! We had settled at our table at Sam’s with our pizza slices and glasses of water, when I decided to take a picture of Aaron. He agreed to the picture only if I let him pose as a Star Wars clone. He told me to send the picture out with the explicit description that he was making the face of a Star Wars Republic Commando clone…..the PC game, not the movie. OK, got it, Aaron! He then asked me if I was going to use the shopping cart that was big and flat…..because then he could ride on it like Barb and Brandy let him do when they take him to Sam’s. I told him no, I was not using that flat cart, and he was disappointed. He continued to ask me about this as we talked during lunch, pointing out how others were using the big flat cart. But they weren’t pulling a big Aaron on their flat carts…..which didn’t matter to Aaron at all. He didn’t think it would be at all unusual for him to be pulled on the big flat cart…..like Barb and Brandy do. So I reminded him that I had been nice to let him come with me. I had been nice to get him pizza for lunch. I was being very nice, I told him. I laughed as I walked and Aaron lumbered beside me on our way to claim our cart…..our normal cart. And in that normal cart we placed some items that made Aaron very happy…..and walking made him feel better. He really didn’t need the big flat cart at all. This morning, as I prayed, I thought about the comment that Aaron made. Sometimes I question God’s direction in my life…..what He allows and what He takes away. In my own way, I am Aaron. I don’t always recognize how “nice” God is to me because my eyes and my thoughts are instead on the things that He is not giving me. I want Him to, in a sense, pull me along on that big flat cart…..doing everything my way. God, can’t You be nice to me a SECOND way? I know You have done this for me and that for me, but I also want this other thing. I think I NEED this other thing. But God in His wisdom says no….and if I but look, I’ll see that His plan for me, a normal cart, can also be filled with many wonderful items and blessings that I might have missed had He given me that other cart……that SECOND way that I so wanted. Help me, Lord, to stop asking You to be nice to me a SECOND way, and to be thankful and trusting for the way that You have chosen for me each day. Author hesaidwhatksPosted on October 2, 2014 February 28, 2016 Categories Adult Autism, Asperger's Syndrome, Thankfulness, TrustLeave a comment on Can’t You Be Nice?